The sheer number of digital documents can be beyond comprehension. The SharePoint SkyDrive site aggregates all the documents that you are following into a single dashboard. SharePoint is a product that was developed from the beginning to help manage digital content. 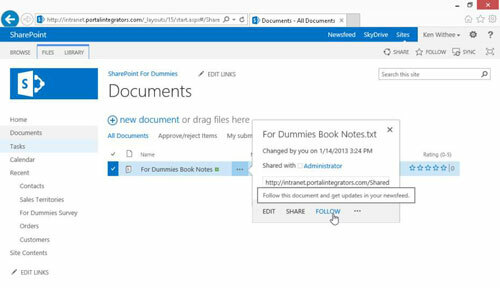 As each team begins using SharePoint, it can become burdensome to navigate to each site and monitor each document. A modern organization generates an unbelievable amount of digital content. SkyDrive helps with document management. Browse to the app that contains the document you want to follow. Click the ellipsis next to the document and click Follow. A dialog box pops up in the upper-right corner of the screen letting you know you are now following the document. Navigate to your Sites page by clicking SkyDrive at the top of the SharePoint window. Click Followed Documents in the left navigation area to see the document you just followed. The documents you follow are displayed along with the web address of the document. Below the web address is a link you can click to stop following the document.